Elon Musk, Mars Expeditions and Autonomous Driving. Elon Musk, Mars and Driverless Cars. Today Salomondrin, a prominent YouTube automotive enthusiast and entrepreneur revealed his purchase of a brand new Tesla Model X. It gets better. 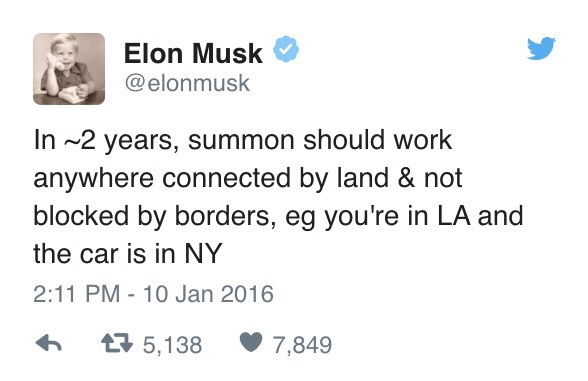 He later goes on to state that one of Tesla’s goals with their cars is to create fully driverless cars. This news comes after Elon Musk clarified this statement via Twitter and at the Startup Hong Kong Event. The news of driverless cars is not only amazing and way cool and enticing, but it’s the story Elon Musk, the living IronMan, who has been able to produce these forms of innovation. With the ability of his teams for Tesla, SpaceX and SolarCity, along with his wit, eagerness to learn and clear, concise processes to achieving his goals, Elon Musk is highly competent and successful in changing and improving our world and a good example to model. Along with the quotes and golden nuggets for success, he shares in the interview plans to achieve manned missions to Mars within 15 years realistically. It’s driving and invigorating to see this form of drive, ambition and grit to take on these challenges and make it seem so effortless. Click the link below to watch the interview. I’m sure you’ll learn a lot. Thanks for reading and make sure to share this post! Follow us on Twitter @AOG_Enterprises and subscribe to our newsletter! Previous Previous post: 7 Ways To Succeed In School & Life!